Caregivers often burden themselves with a long list of self-imposed oughts, shoulds, and musts. If there is one emotion that nearly anyone caring for an aging loved one can count on feeling, it is guilt. Caregivers often burden themselves with a long list of self-imposed oughts, shoulds, and musts. Some days you feel guilty because you want your responsibilities as a caregiver to end. Other days you feel guilty because you think you are not doing a good enough job as a caregiver. One of the sad emotions — which also includes agony, grief, and loneliness — guilt is an emotion people experience because they are convinced that they have caused harm or are responsible for someone else’s misfortune, whether this is the case or not. When it comes to emotional health, there is no such thing as a good or bad feeling. Emotions, including guilt, live in the most primitive part of the brain — the one that has been around the longest and has evolved to help people make choices to stay safe in the world. They serve a purpose. Even guilt. For example, if your feeling of guilt stems from a belief that is realistic and helps you move toward your goals in life, it can be incredibly helpful. Think of it as your body’s way of saying, “Pay attention.” A little guilt can help you be more sensitive and attentive. However, guilt is a complicated emotion. The problem occurs when you mistakenly suffer under the illusion that you have caused other people harm, when you misinterpret what happens, and when you do not question the logic of your conclusions. Sometimes known as “false guilt” or “disproportionate guilt,” this type of guilt only makes you even harder on yourself than you already are, which is not helpful to anyone. For example, if your feeling of guilt is based on some unsustainable belief that you should be perfect all the time, then it is probably eating you up without helping you decide how it is best for you to handle a given situation. Caregivers often magnify what they have done, take personal responsibility for everything that goes wrong, “should” themselves instead of understanding themselves, and unrealistically expect themselves to only have positive feelings. According to a State of Caregiving report, nearly one-quarter of adult children who are caring for an aging loved one grapple with guilt multiple times a day. Sons and daughters are also more likely to subscribe to the belief that they are the only ones who can take care of their loved one properly. This could be a contributing factor behind why adult children experience caregiver guilt. If you believe you are the only one who can take care of your loved ones properly, you are more likely to take on too much caregiving responsibility and then feel undeserved guilt when you become overwhelmed. Fortunately, caregiving does not have to be a guilt-ridden experience. 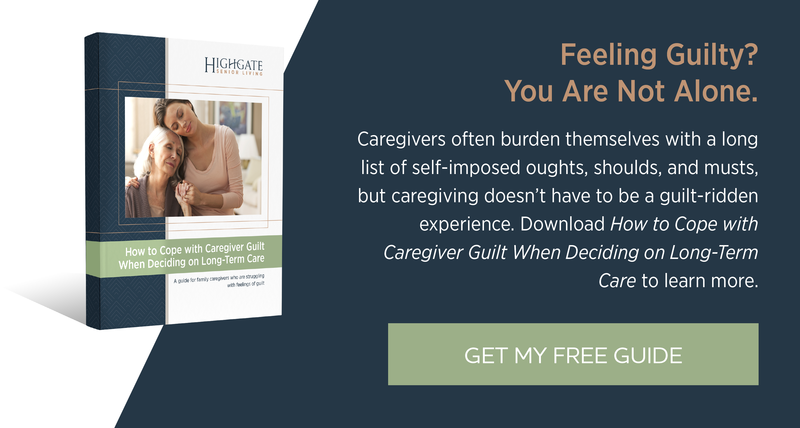 Download How to Cope with Caregiver Guilt when Deciding on Long-Term Care, a guide for family caregivers who are struggling with feelings of guilt.